It was a race filled with new experiences of pain, mental strain and overcoming the desire to not go mad and pull out with 10 km to go. 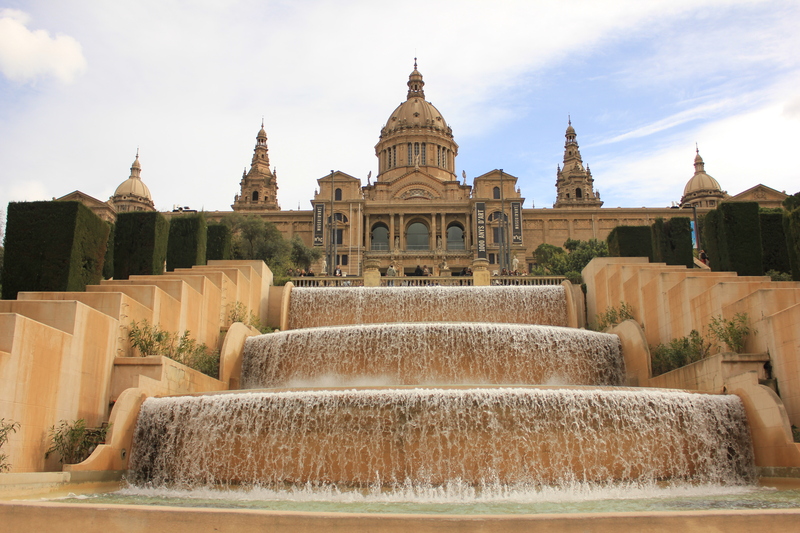 Starting in the Espanya area of the city, in front of scenic fountains, the start zones for your predicted times were quite chaotic. Fellow runners, sneaking through fences to gain entry, made parts very busy and was not ideal for last minute mental preparation. There was good support as runners crossed the start line and with the apt Barcelona song by Freddie Mercury and Montserrat Caballo playing, the hairs on the back of your neck may rise and the adrenalin kick in. The marathon immediately began with long gradient roads which seemed to climb for several kilometres. Roads are quite wide so there was plenty of room to get into your pace and rhythm in order to manage these, however the support was sparse. 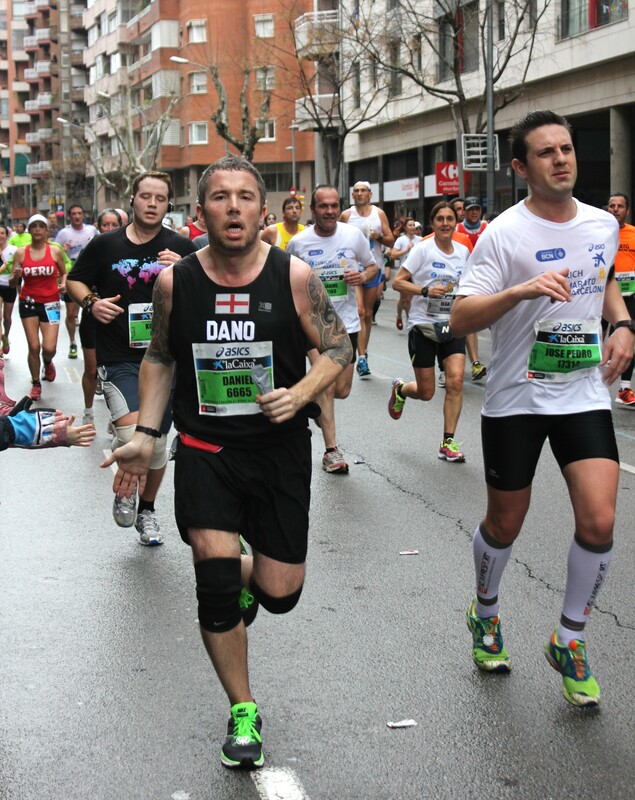 The course took on many long, straight as a die stretches of road; the first being along Carrer de Sants. Concentration on your pace is a must as it can be quite monotonous and you may feel the need to speed up to escape to more interesting parts of the course. With the course continuing to climb, the first major landmark, the Nou Camp, arrived at around the 6 km mark; a welcome distraction from the lack of atmosphere. Water stations were frequent, approximately every 5 km, and throughout the latter parts of the course there were varying drink and food supplements. Toilets were also at similar points but for some reason more unnoticeable so be alert if nature calls as you approach. The course rolled on with no major attractions. Kilometre markers were quite clear and popped up every kilometre. Lack of music and support from the sidelines was very much a downside though as, with many of the roads looking similar, the marathon can just drift on and away from you if you do not keep focused. 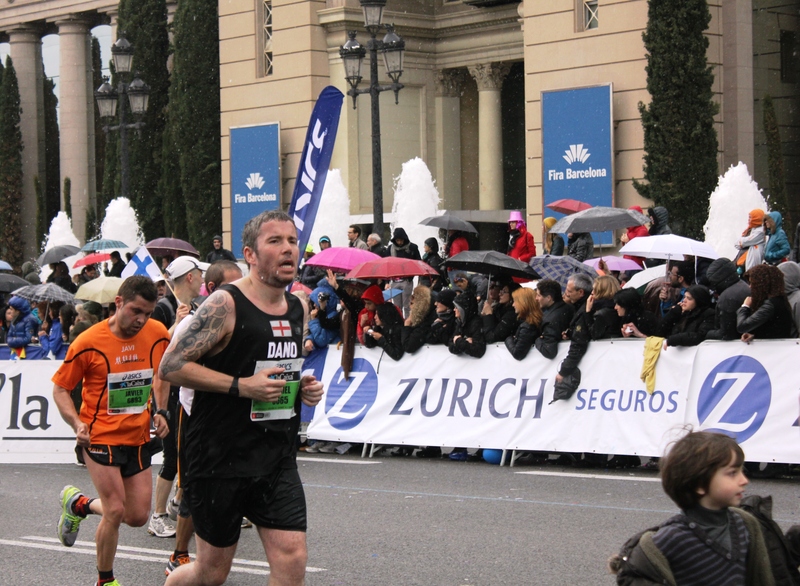 Between the 14 – 16 km marks takes you past La Pedrera building which is then followed by the famous and more inspiring Sagrada Familia where support was fuller. The Meridiana part of the course is most likely every marathoners not so favourite layout, the loop! With this at the 20+ kilometre mark, seeing fellow runners on the other side of the road 4-5 km ahead is always a painful and sometimes demotivating experience so beware. ‘Half Marathon’ was signposted clearly with a more impressively sized digital clock, and at this point support noise increased. The course started to level out around 25 km which was a relief particularly after having just crossed over a small but fairly short, sharp bridge climb. Into a part of the city called Diagonal, another long stretch of straight road awaited combined with another loop which brough runners to the 31 km mark and a turn onto the sea front. It was around this mark where I hit the wall for the first time in my marathon career. The feeling actually started to appear at the 30 km mark, the marker itself making me aware this could happen, and it did. I survived just and hung on in there, one foot in front of the other as I knew I would get a second wind eventually. Support was still in phases but the palm tree lined road and view of the Mediterranean was uplifting as you knew you were only 10 km or so away from the finish. Water stations continued to pop up but now with more fruit and carb gels being handed out. Be careful not to overload as with fatigue possibly starting to settle in a major mistake I made was grabbing a handful of nuts and in my slight panic in needing to refuel ate the nuts last after I had finished my last drink. Dry mouth ensued until the next water station; not a good feeling with several kilometres to go. With the end approaching support started to increase with the odd live band and more boisterous crowds cheering as runners passed under the Arc de Triomf. The course was still predominantly flat and with passing the final landmark at the 40km mark, the Colom, a straight road called El Paral.lel lead runners to the now crowded finish line. The course turned left onto the final 200 metres and with several sponsor-labelled inflatable arches to run under the welcome sign of Zurich, the races sponsor, was the finish line. Crowds were either side, with grandstands like those at the London Marathon. Once though the finish line, the ceremony of taking off your timing chip, receiving your medal, and general volunteer support was as per the start, quite disorganised. Considering you have just run a marathon you do feel like you are left on your own to source some direction. Ten yards past the finish line and a water station awaited, not needed straight away I thought. Next was chip removal. This was done by the volunteers sitting on small stools and if you don’t look you can pass them by quite easily. Once you have found someone you have no small ramp to walk up, unlike at London Marathon, so with your last piece of energy have to lift your foot onto a stool for the chip to be cut off. Sounds easy but after 42 km I found this very hard. Once you have managed this obstacle then it was a case of finding where to receive your much deserved medal. I found the best way was by asking the volunteers who pointed me in the direction, just around the corner from the finish line. This is something I feel should be there first instead of the chip cutters. Medal around neck your are then hit with another food station. Orange segments, bananas and the dreaded nuts. Freedom from the process and the marathon is then done and the quest to find your loved ones, friends and family starts. A good place to meet is by the picturesque fountains which started us off all the those painful hours ago. Wow. Quite an adventure. The Magic Fountain must have been a welcome sight. Well done. Thanks. It was a marathon to remember, mainly my first experience of hitting the wall.